The European Central Bank’s (ECB) bond-buying programme is legal and within the powers of the central bank, the advocate general of the European Court of Justice (ECJ) said on Thursday (4 October), amid a challenge in Germany to the bloc’s quantitative easing (QE) programme. It is the second time the EU’s highest court – more precisely, its senior official in this case – has said the ECB’s extraordinary monetary policy measures, under which it has announced or adopted various ‘non-standard’ measures in response to the euro area sovereign debt crisis, are within the bounds of EU law. In 2015, the Court ruled in the Gauweiler Case that the ECB’s Outright Monetary Transactions (OMT) programme – which has been announced in September 2012 but never yet been used – did not break EU treaty law. The idea is that the ECB would buy government bonds in the secondary market, from a party that has bought these bonds first from a Member State, rather than from a Member State directly, since the Treaty prohibits the ECB from acquiring government bonds this way – as this would amount to monetary financing or becoming a direct lender of last resort to a Member State. The applicants before the German Court argued that the ECB had overstepped its Treaty role by creating a programme that should be viewed as a tool of economic, not monetary policy and it was also alleged that the programme violated the prohibition of monetary financing. The plaintiff also argued that the OMT programme, when executed, would constitute a violation of the budget sovereignty of the German parliament. This right is provided for in German basic law (the German constitutional law), so the plaintiff ended up of the German Federal Constitutional Court (FCC), which decided not to give its decision until it had confirmed the programme to be either compatible or non-compatible with EU law. The FCC, therefore, decided to ask preliminary questions to the CJEU. It is important to note that these were the first preliminary questions asked by the FCC and the tone of the questions was bold. On the other, the actions and attitude of the ECB were expressly determined as ECB president Mario Draghi’s statement: „whatever it takes to preserve the Euro” – although the full quote included the words „within our mandate”. Overall, the Court concluded that the OMT programme is compatible with the prohibition on monetary financing: under those conditions, indirect bond-buying through the OMT programme would have an effect on Member States’ access to credit, but that effect would not be equivalent to that of buying bonds directly from Member States (monetary financing) and it would not defeat the purpose of the ban of monetary financing, which is to encourage Member States to pursue a prudent budgetary policy. After this ruling, a series of claimants in Germany opposed the legality of the ECB buying public bonds on secondary markets under public sector asset purchase programme (PSPP, generally referred to as ‘quantitative easing’ programme) and the FCC then referred the case to the ECJ. The ECB’s QE programme, which is being gradually wound down, was launched to drag the eurozone economy out of low inflation and to stimulate growth. According to the FCC, this programme violates the previously-discussed legal framework that was generated by the court in the Gauweiler case. After looking at its national concerns, the FCC refers to the prohibition on monetary financing. 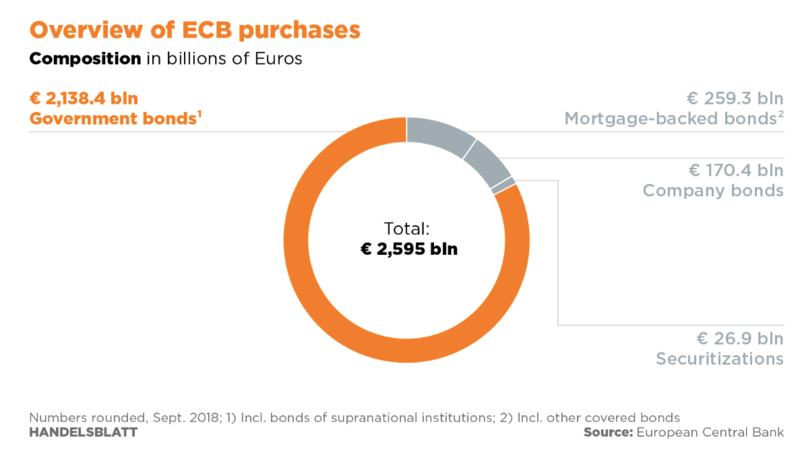 The FCC argues that even though the bonds are purchased on the secondary market, de facto the market sees it as a guarantee that the Eurosystem will purchase these bonds. After assessing the case, advocate general Melchior Wathelet rejected complainant arguments that the ECB’s 2 trillion-euro purchases of government bonds had bankrolled indebted governments and distorted financial markets, concluded that the „decision of the ECB establishing the PSPP has not revealed any factor capable of affecting its validity”. Wathelet defended the ECB, saying the programme „does not infringe the prohibition of monetary financing” and did not exceed the Bank’s mandate. The programme, the chief judge argued, does not give the ECB’s action an effect equivalent to directly buying member states public debt. Concerning the allegations that PSPP might distort conditions of issue of government bonds, the advocate general decided that PSPP offers „sufficient guarantees” to prevent it. Wathelet highlighted that the ECB Governing Council decides on the scope, the start, the continuation and the suspension of the intervention on the secondary markets and is subsidiary to other asset purchase programmes. Furthermore, he stressed that the purchase is limited and is representative of all members of the euro area. The claimants not only questioned the programme itself but also the participation of the Bundesbank in the implementation of those decisions and the failure of the Federal Government and the Lower House of the German Federal Parliament to act in respect of that participation and decisions, considering that the ECB undermined the principle of democracy enshrined in the Grundgesetz German Basic Law and German constitutional identity. Once that ruling is out, the case will go back to the German court in Karlsruhe, where the group of conservative German academics and politicians brought the original case. Although the programme is set to end at the end of the year in any case, the Court’s ruling will set a key precedent for future ECB policy decisions. For the list of references, click HERE.